The abuse of Eddie Jones by so-called Scottish rugby fans (from the looks of them I doubt very much that they had anything to do with our game) at Manchester Piccadilly station on Sunday is quite shocking. Even more shocking, however, is Eddie's admission that his England squad do not have the athletic ability to win playing "pattern football." Erm, what happened to the team being 40% fitter than two years ago? Why, if the current squad is not (and cannot be) athletic enough, have players not been added to the squad who can fulfil those requirements? Because what is becoming abundantly clear is that England cannot and will not win a World Cup (or maybe even another Six Nations) without, at the very least, a vast improvement in their collective speed to the breakdown. Remember the 2003 England pack were rather unflatteringly labelled by the Kiwi press as "white orcs on steroids" but still featured a back row of Hill, Back and Dallaglio - one of the quickest and most athletic loose trios of the time. 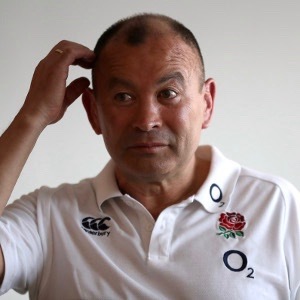 So if Jones has conceded that England's forwards are never going to be faster and better over the ball than their opposite numbers then the problems are far bigger than I first thought.